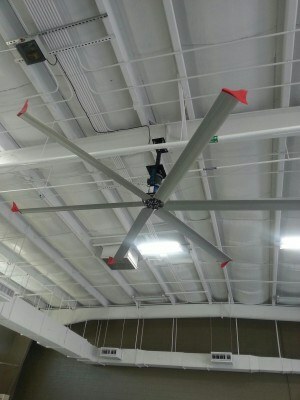 HVLS or high-volume low-speed fans are used in industrial and commercial premises, moving large amounts of air. This is the most efficient types of fans. HVLS fans can be used on their own or in combination with existing heating or cooling systems to provide better comfort and lower energy expenses at the same time. Not only will you feel up to 10°C cooler, HVLS fans are up to three times quieter than other industrial and commercial fans. They can be used in a variety of locations, including warehouses and manufacturing facilities, gym facilities, auto dealers and more! Whether you’re looking for ceiling fans, gas boosters or something else, we aim to ensure you have the peace of mind and the support you need to improve your business operations. Our industrial ceiling fans are supplied by SkyBlade. You can find all the Skyblade fan information on our new miro-website today, solely focusing on this excellent product: skybladefans.com.au! If you would like to learn more about our HVLS industrial fans, please don’t hesitate to get in touch with our friendly team. We’d be more than happy to assist you and provide you with the expert advice you require. You can get in touch with us by calling our Australian office on 1300 556 380 or our New Zealand team on +64 9 274 5111. Alternatively, feel free to fill in our online enquiry form on the contact page of our website and we’ll do our best to get back in touch with you as soon as possible with all the information you require.